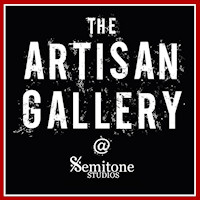 Semitone Studios has a first floor Artisan Gallery. This is managed by local photographer Natalie Lane and showcases her stunning photographs as well as offering a bespoke framing service, and a range of handmade crafts by local artisans. Natalie’s shots of Marple’s famous aqueduct are particularly striking. The Artisan Gallery is open every weekday 2pm – 6pm and Saturdays 10am – 3pm.